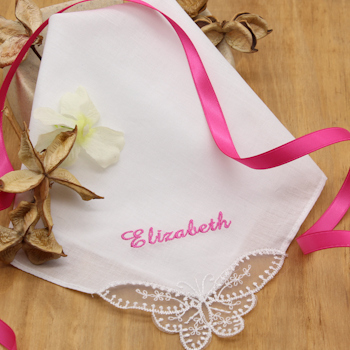 Ladies personalised single cotton and butterfly lace corner handkerchief embroidered with monogrammed initials, a name, or a nickname. Ladies personalised single cotton and butterfly lace corner handkerchief embroidered with monogrammed initials, a name, or a nickname. Every lady should have a lovely handkerchief in her handbag. A single smooth white cotton handkerchief with a beautiful butterfly organza and lace motif to one corner (great as a anniversary or wedding hanky too!). You can choose the additional option and order a gift set of three matching handkerchiefs. Make someone very happy with a unique gift dedicated to them.